Back in the 50’s & 60’s, one of the largest musical instrument retailers in Sydney, Australia, was Nicholsons. I vaguely remember their premises in a prime location on George Street, in the CBD. They indulged in some importing & distribution of instruments, but we don’t know the full scope of this activity, and they also had some guitars & amplifiers manufactured here in Sydney. Nicholson’s house brand was in fact Challenge, and they marketed various guitars & amps with that brand name. The guitars were possibly cheap knock-offs of Strat style guitars, and were likely sourced from Japan, as well as locally. 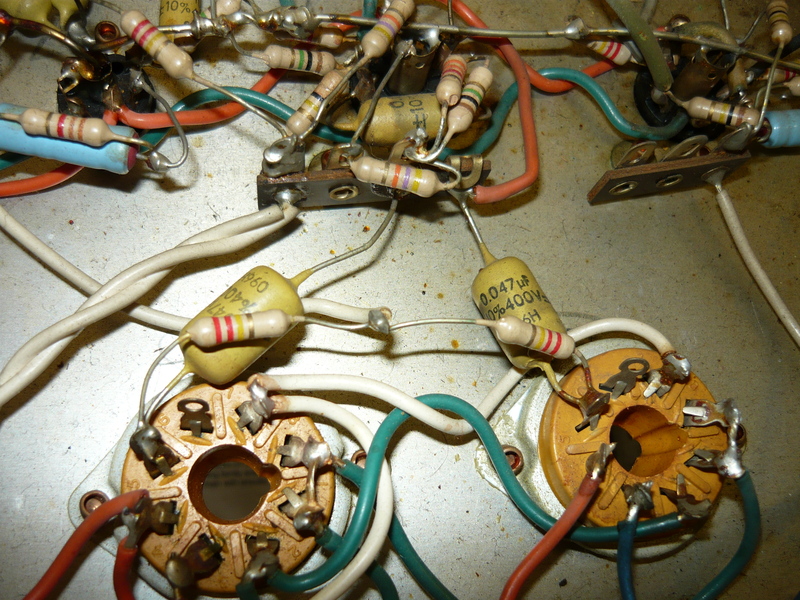 The Challenge amplifiers were much more interesting and were seemingly destined to survive longer than the guitars. The subject of this week’s blog is only the 2nd Challenge amp we have ever seen, since taking up amp servicing on a full-time basis, but obviously they are still out there in unknown numbers. The Challenge amps were designed & built for Nicholsons by ZJM Industries, located in Waverley, in Sydney’s eastern suburbs. The primary consideration for Nicholson’s would have been to produce the house brand products at the lowest possible cost. The ZJM story is indeed a very colourful one. ZJM stands for Zoltan Julian Mielnik, and he was a Polish immigrant to Australia in the aftermath of WW2. He was rumoured to have been in the Polish Army, possibly in their Intelligence Service, possibly was even a prisoner of the Russians and sent to Siberia. Some even suspected him of being a spy ! How does someone from such a background end up building valve guitar amps, and respraying guitar bodies, winding pickups, etc etc etc, in Sydney suburbia ?? We don’t have any of the answers to this mystery, but we would like to hear from anyone who does. 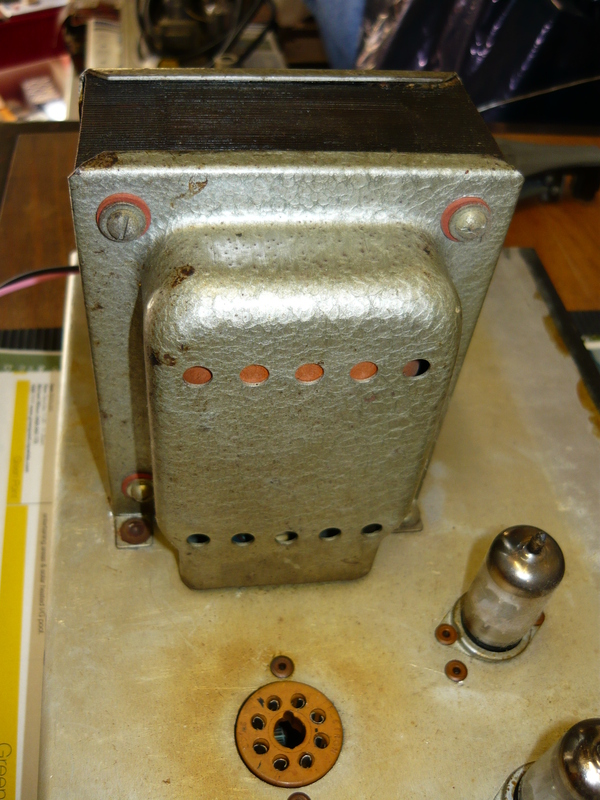 The amp that inspired this blog, was received from customer Greg as a very unknown quantity, requiring a full appraisal to decide whether a restoration job was justified. The most important thing, initially, was to prove that the two huge transformers were functional, which they were, so then we could arrive at an agreed $$$ figure to complete the job to get this amp useable and meeting electrical safety standards. We still had no idea what this amp would ultimately sound like, so it was a bit of a gamble for Greg, but one that paid off in the end. 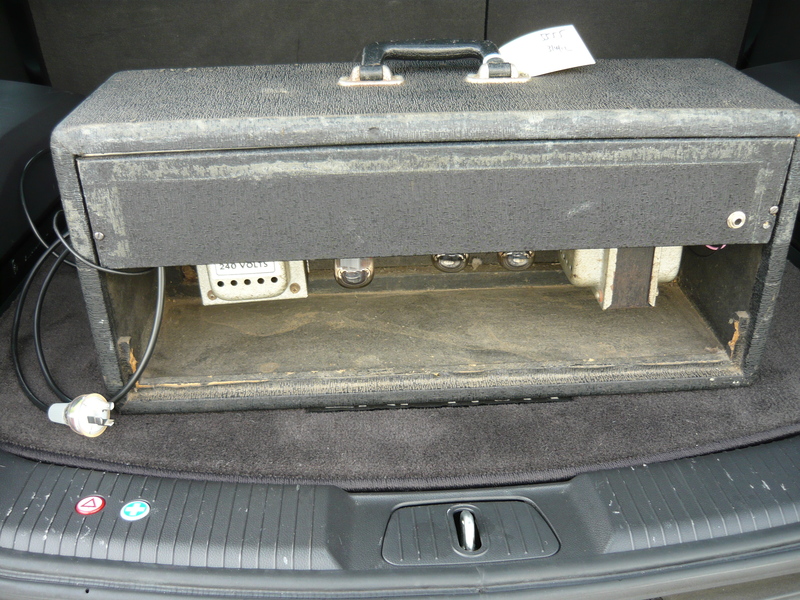 As you can see from the photos, the amp is wired up in a seemingly fairly random manner. 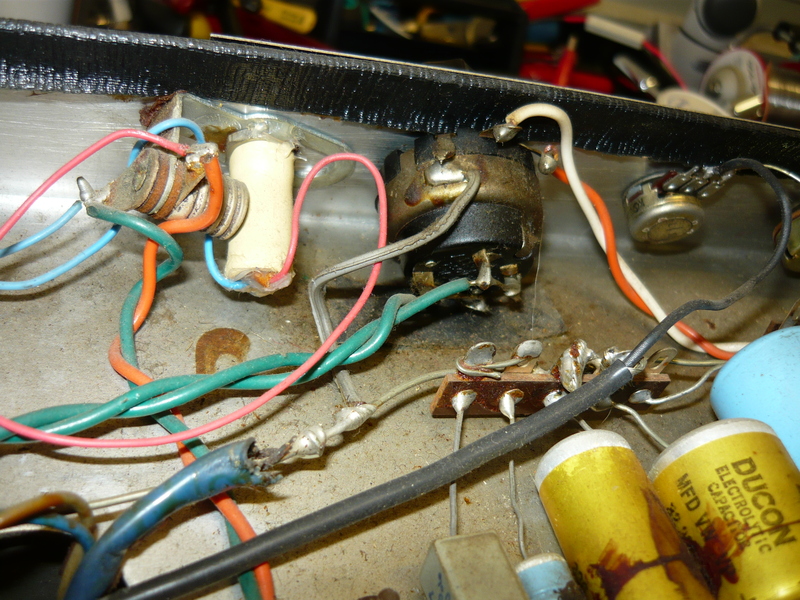 Low budget amps from this late 50’s/early 60’s period show scant regard for contemporary electrical safety standards – quite often there isn’t even a fuse. 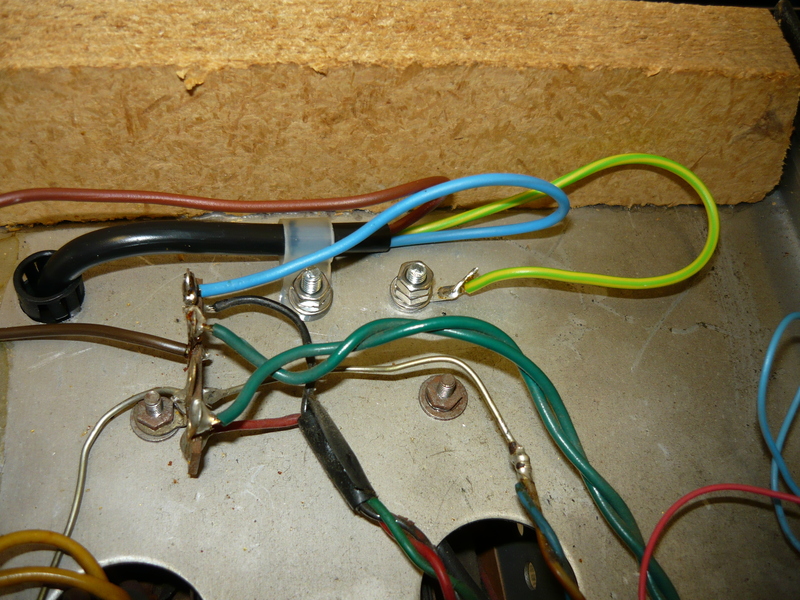 This amp required complete rewiring of the 240V side of things, with a new 3-core mains lead, 3-pin plug, the installation of a grommet and cable clamp, and the installation of a fuseholder & fuse. The mains earth connection requires its own dedicated nuts/bolt/solder tag – not a shared connection. 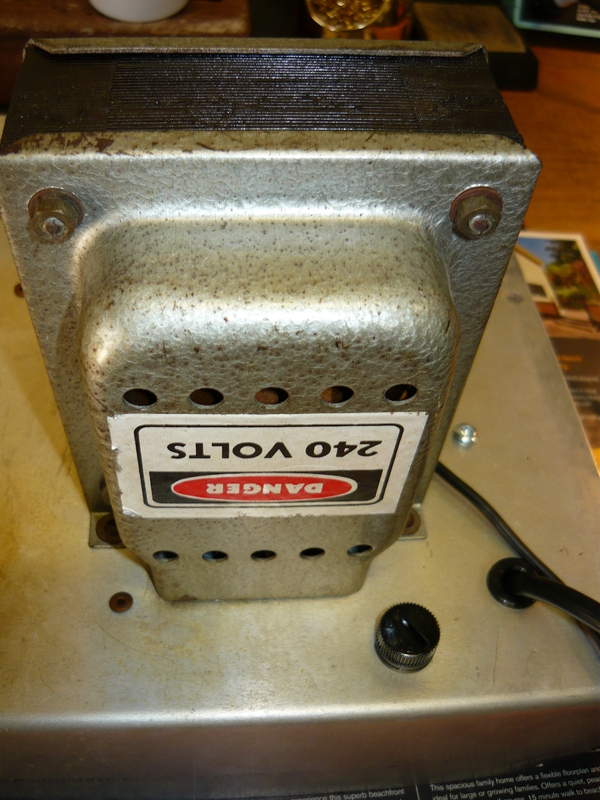 Every electrolytic capacitor looked original and needed to be replaced, which we did. 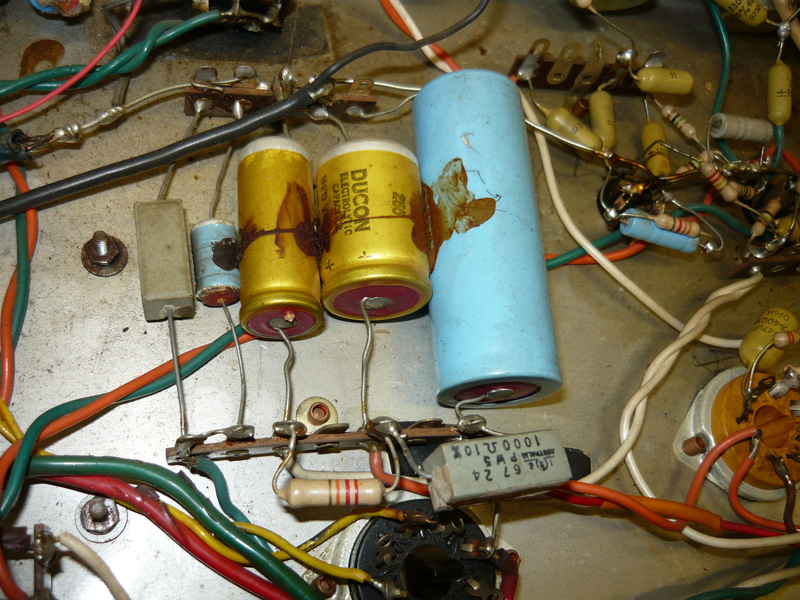 Interestingly, all the signal capacitors are the now famous “mustard caps”, renowned for their great guitar amp tone. 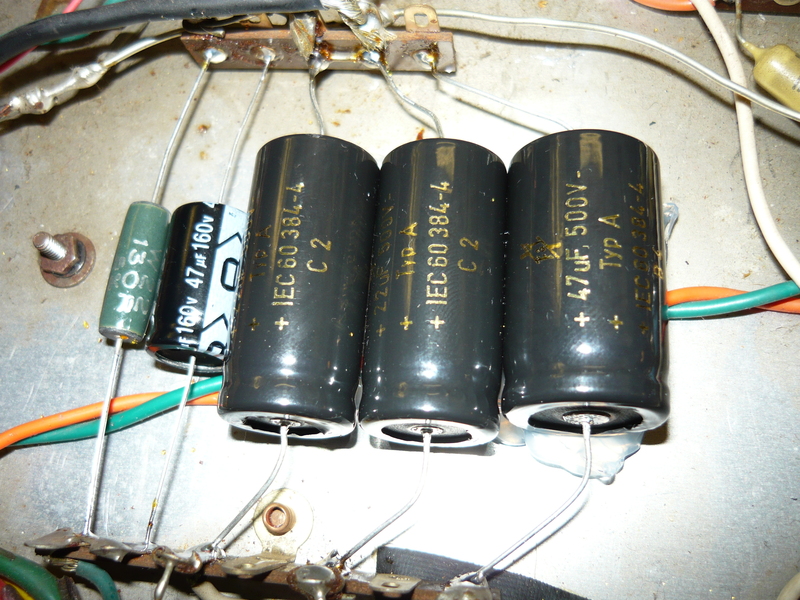 Many Aussie manufactured domestic electronics employed these capacitors in the 60’s. The larger caps are bedded down in silicone (neutral cure). A general clean up of jacks, valve sockets & pots was required, with some new pots installed. New valves installed were a 12AX7 in V1, a matched pair of EL34 output valves, plus a 5U4 rectifier valve. 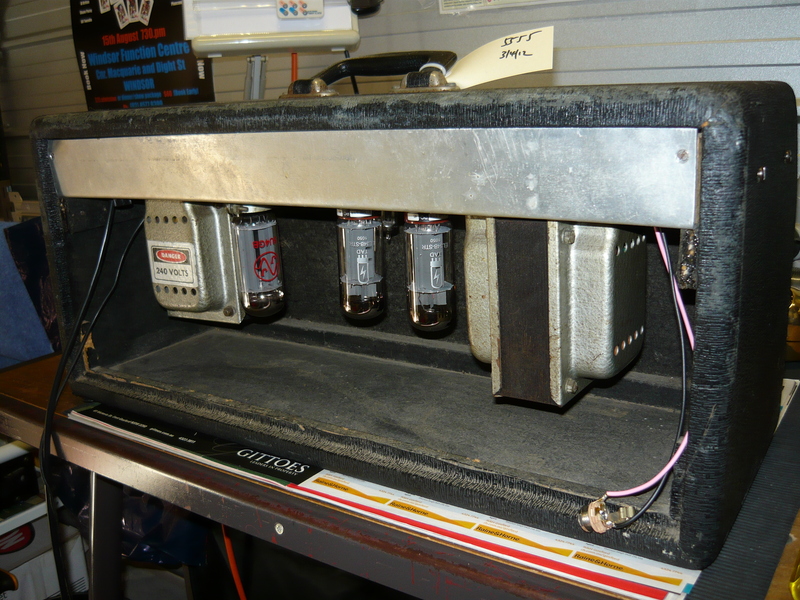 The use of off-the-shelf transformers (rather than OEM units) in this amp is a dead give away that only small quantities of this model were ever going to be built. The transformers lack any kind of identification, but they look exactly like the multi-purpose units sold in the day through electronics wholesalers, and probably manufactured by Ferguson, A&R, or similar companies. The transformers are physically quite large, and were comfortably over-engineered for the job – no wonder they have survived. 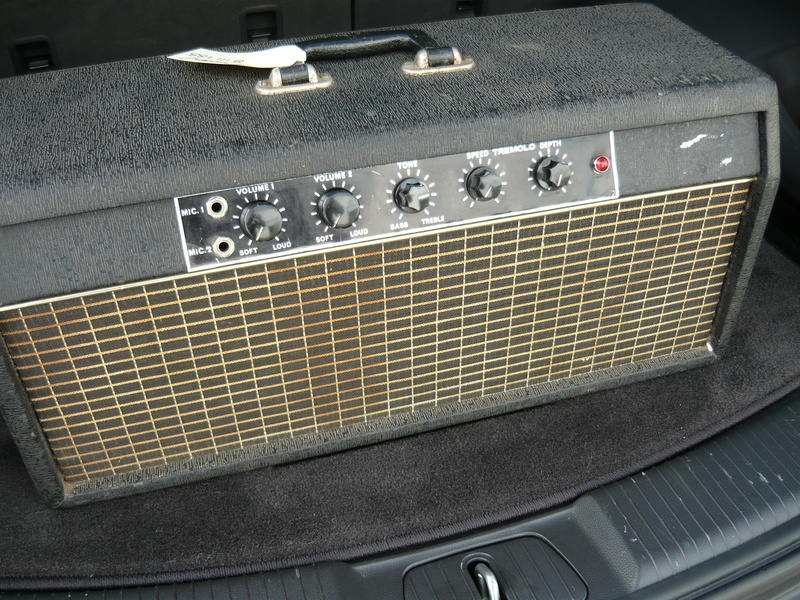 This amp lacks any kind of a model name, model number or serial number, so we have no idea where it sits in the ZJM heirarchy of amp designs, or even approximately when it was built. We just know that it sounds great. Neil Young would love this amp. 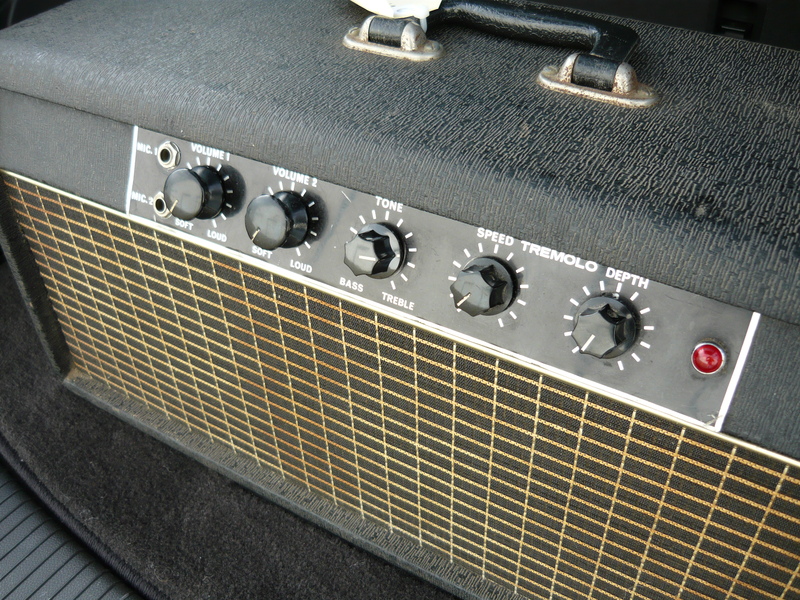 The front end is very similar to the famous tweed Deluxe amp as used by Neil, with a very simple circuit and just two volume controls and a single tone control, in this design common to both channels. The two volume controls interact with each other as per the tweed amps. This amp also has a very sweet sounding tremolo on board, which modulates the bias for the output valves. The big difference between this amp & the tweed amps, apart from the big Aussie transformers, is the power amp stage, employing a pair of EL34/6CA7 output valves in a Class-A/cathode-bias configuration. These valves are drawing a lot of current, before you’ve played a single note, yet the transformers remain relatively cool. The power amp develops 20 watts/Class-A into 8 ohms, at the onset of clipping, and sounds huge. Greg assures me that when he got to turn the amp up flat-chat, it sounded even better. You may have noticed only two of the original control knobs have survived – the others are generic. The Challenge sticker has also been removed at some point. The only way we knew for sure that this actually was a Challenge amp was by direct A/B comparisons with another Challenge guitar amp ( a 15 watt 1X12 combo). The grille material looks the same as that used on the Moody amps, also of Sydney (Lidcombe), which initially caused some confusion. Due possibly to the complete lack of high frequency pre-emphasis, and the huge midrange response, this amp sounds particularly fine with Telecaster style guitars, and other brighter instruments. You know – we Aussies were making very unique & great sounding amps as far back as the late 1950’s (and even pedal steel guitars as far back as the late 1940’s), and yet hardly anybody remembers or knows anything about any of this stuff. So much of it seems to have disappeared off the face of the planet (apparently). It goes without saying, we would love to hear from anybody who has any more information about the Challenge amplifiers and also their builder, ZJM Industries. This is all part of our musical heritage, so let’s try to keep it alive ! Best regards, IR. This entry was posted on June 26, 2012 at 11:42 am and is filed under Amp Repair, Amps. You can follow any responses to this entry through the RSS 2.0 feed. You can leave a response, or trackback from your own site. I also have a challenge amp it came with a small speaker that sounded pretty crap so I converted the combo into a head and plug it into my fender blues delux amp lorance 12 speaker and it sounds awsome, nice and warm an chimey,good for small quite gigs. Just purchased a Challenge amp from an Antique store,simple volume/treble.bass setup,12 inch speaker,from what I can gather its probably a 15 w version, plugged it in,quiet but clean sound,had a look in the back,needs the tubes replaced,they didnt light up much,send for a full service next week and maybe add some photos at a later date:) the two inputs on the panel have BASS underneath them so maybe thats what it was.